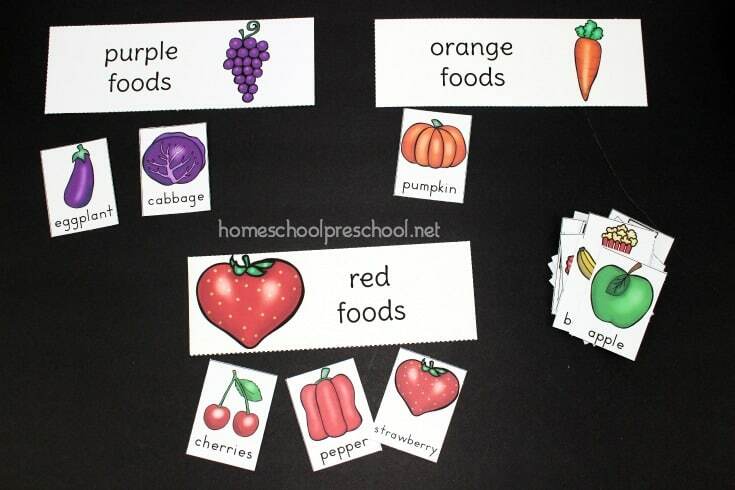 Print out and sort all types of foods with this pack of preschool food theme sorting activities. Sort by color, fruits and vegetables, healthy and unhealthy foods. Children are often attracted to sorting activities. Oftentimes, they sort objects without even knowing that they are sorting. They may line up their Matchbox cars by color or their stuffed animals by size. Sorting is a beginning math skill that lays an important foundation for later math. By sorting, children learn that objects are alike and different. They learn that things can be organized into groups including numbers and shapes. 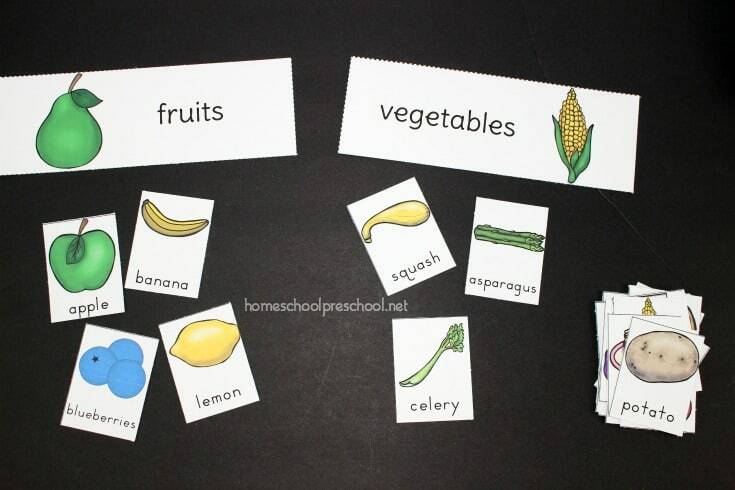 These preschool food theme sorting activities are a great addition to your preschool lessons. 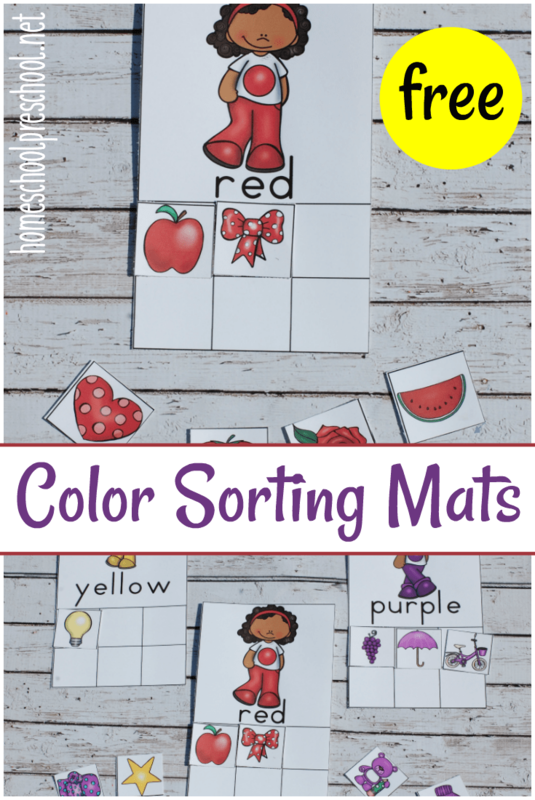 Whether you are teaching colors, healthy eating habits, types of food, or any combination of those, these three sorting activities will help your preschoolers practice sorting by different attributes. I suggest printing these pages on cardstock. This will make the cards and labels studier than using on printer paper. After printing, I would also laminate the cards and labels. Laminating them will make them last longer so they can be used over and over again. Now, cut the labels and cards apart. 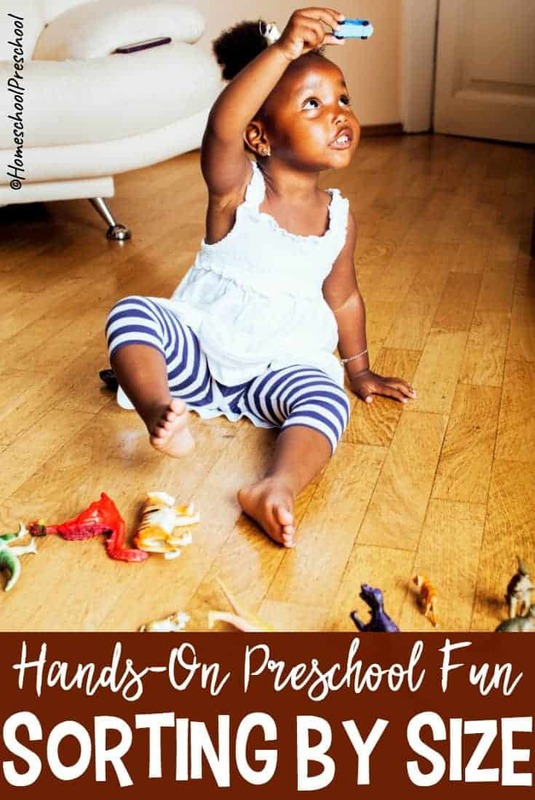 You are ready to set this activity up for your preschoolers. If you are working on colors with your preschooler, this activity is perfect. There are eight labels and 45 food cards. Students will sort the cards under each of the labels – red, orange, yellow, green, blue, purple, white, and brown. Whether you’re teaching your kids about healthy foods, the four food groups, or nutrition in general, your preschoolers will enjoy this food sorting activity. 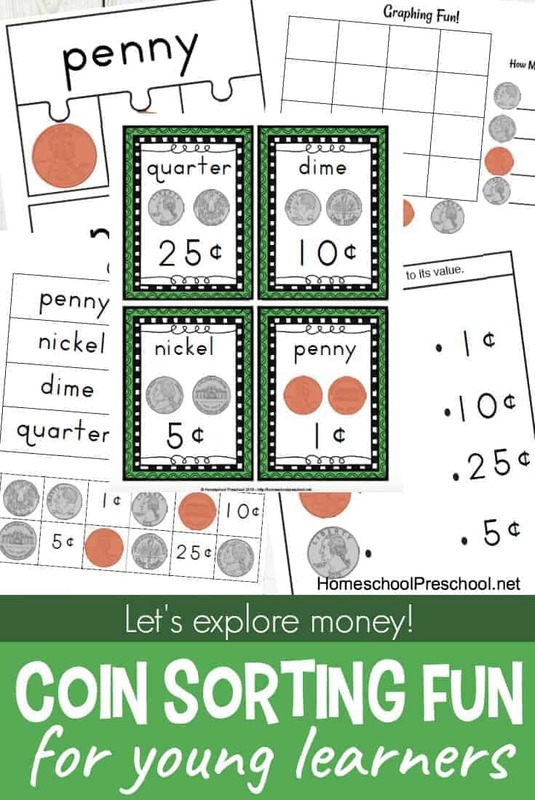 All of the food cards can be used in this activity. As they sort, engage preschoolers in a conversation about why a certain food is healthy or not healthy. Why should we eat healthy foods? What makes a food unhealthy? Do your children know the difference between fruits and vegetables? This is a great activity to teach or reinforce the concept. You can remove all of the cards that aren’t fruits and veggies to make the activity a bit easier for younger children. Or, you can challenge older ones by leaving all of the cards in. 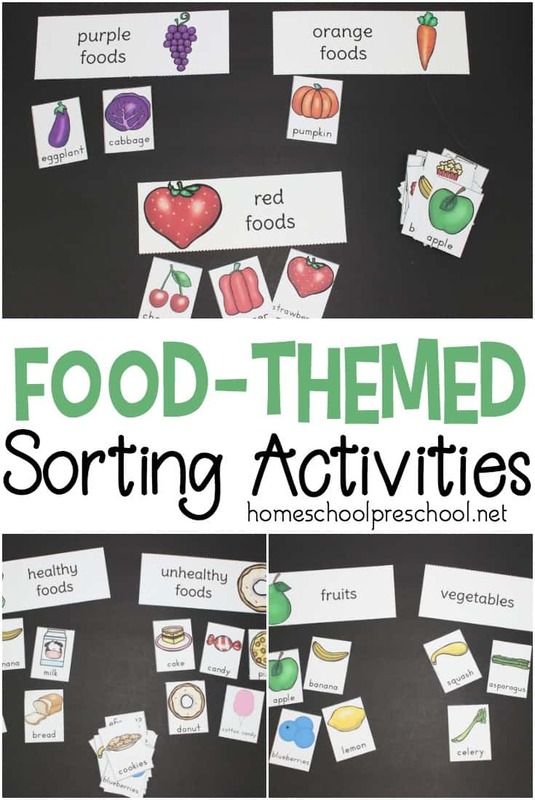 Whichever of these preschool food theme sorting activities you choose, your kids will practice sorting while learning more about the foods they eat. 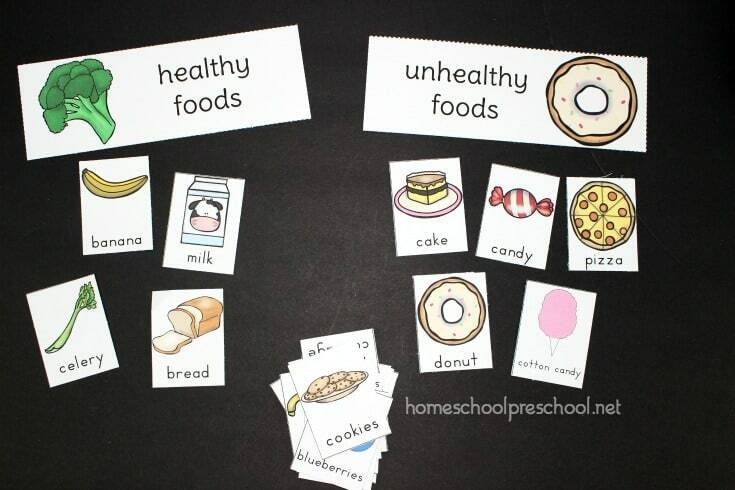 Are you ready to work on sorting foods with your little ones? Grab your copy by clicking the download button below. Then, head over see how you can teach sorting by size with a fun, low-prep sorting activity.